It is critical that all action plans and vision, mission and strategy statements be prepared in a clear and clean version for distribution. The commitment process is significantly enhanced if participants in the planning process receive their planning notebooks within ten days of the end of the meeting; this promotes a sense of urgency and signals the start of the execution phase of the plan. We document your plan in Microsoft Word and PowerPoint format. Within a week of the meeting, we deliver individual notebooks and CDs to each team member that include the plan, notes from all the discussions, records of input, and insights gained -- over 50 pages of valuable information. The CDs contain all working files, highlights of the plan, and photos of the planning retreat experience for each planning team member. These are working documents designed to support implementation, to be revised during the planning year, and above all, to be timely. Communications is an essential element of implementation. We provide the PowerPoint version of the plan in support of communications to groups that have a role in implementation. 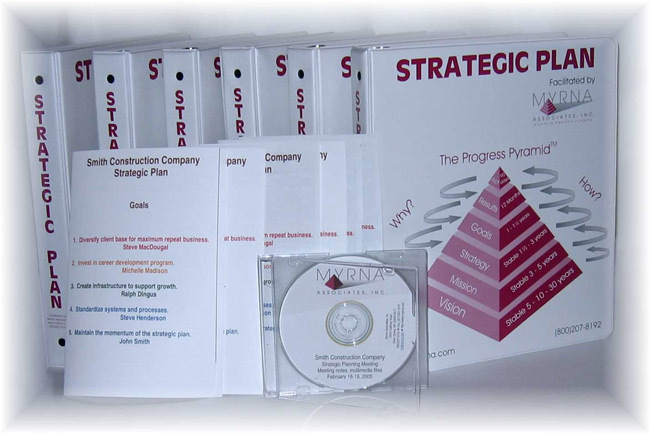 The PowerPoint not only presents the plan, it provides a context for the elements of the plan. It is easier for the Board, Middle Managers, and Employees to support implementation when they understand the organization's vision, mission, strategy, strategic goals, and action plans.